Greening the city, caring for the environment, and empowering poor communities are some of the reasons why the GreenHouse Project started and why other cities should take note. 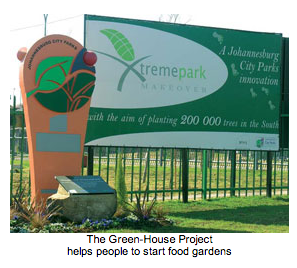 The project helps to create jobs, food gardens and recycling centres in Johannesburg. With a loan from the Department of Environmental Affairs and Tourism the project has taken off. The many high-rise buildings in Johannesburg hide the efforts of people in the city who are fighting high food prices. Joubert Park, which lies between the busy Noord Street taxi rank and Hillbrow, has been turned into a small farm through the GreenHouse Project. The GreenHouse People's Environmental Centre, as it is called, gives information and practical demonstrations. It includes things like caring for the environment, planting food without chemicals, recycling waste material, and growing medicinal plants. The GreenHouse Project also started a co-operative called Randzanani Waste and Recycling. They set up a recycling centre that turns used cooking oil into diesel. People who work for this programme, earn money by collecting old cooking oil in large drums from food outlets in the city. They also collect other used items that can be sold for recycling like cool-drink cans, bottles and cardboard boxes. In this way they not only make a living, but also care for the environment by cleaning up rubbish. Their work has earned them the Bontle Ke Botle award from the City of Johannesburg for helping to keep the city clean. At the beginning of the project, the Department of Environmental Affairs and Tourism gave each worker a monthly wage of R1 200. But the project is now doing so well that they are able to earn a monthly income on their own. They are even motivated to work on weekends to achieve their set performance targets. If they reach their targets, they are rewarded with performance bonuses. With grants from the National Development Agency, the Green-House Project also started food gardening co-operatives in other places around Gauteng. These include Denver, Jeppestown, Duduza, Diepkloof, Alexandra and Protea Glen. The food gardens grow vegetables, medicinal herbs and plants without using chemicals.